Guess who is on the website of the Rancho Santa Margarita Bell Tower ... LOL! That's right, US! My SIL texted me last night with an image from their Fall issue Community Living Guide, where there is a small snap shot of the same photo above included (Page 7). 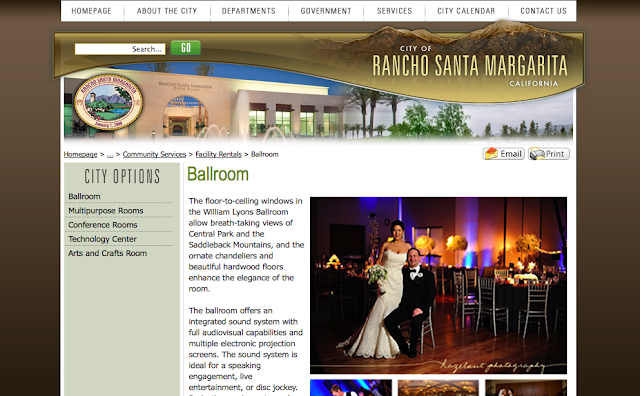 So flattering that they used our picture as one of the few to showcase how one can use the ballroom... and while sometimes working with city regulations can make working with a venue harder, the staff the Rancho Santa Margarita Bell Tower were always very nice, patient and quick to answer all our questions. After our wedding, one staff member said "I've never seen the ballroom look as beautiful as it did for your wedding!" And of course, our awesome photographer Jordana (Hazelnut Photography) captured the evening and every detail PERFECTLY! That's awesome -- congrats! Your wedding was amazing! Love it! You two are gorgeous!! !